Deciduous azaleas are probably the most striking flowering shrubs. Their colours are vivid and bright, and often have the shades that not many rhododendrons can offer. They need full sun. 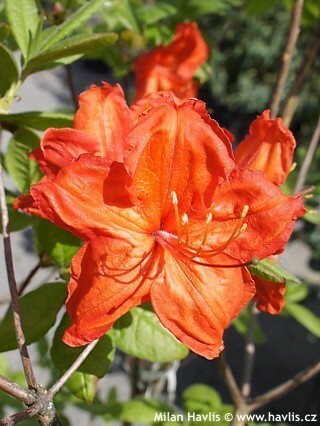 In 1977 Hans Hachmann introduced a sensational deciduous azalea with the richest merge of red and orange colour. Its name is Feuerwerk (Fireworks) and it does look as if taken from the middle of a blazing fire. The individual flowers are large – 7-8 cm across, only lightly scented, and appear from mid May until early June. Deciduous leaves are soft green, oval to elliptic, and turn orange and red in autumn. This azalea received several awards, amongst other two golden medals: at Flora Nova in Boskoop 1987 and at IGA Rostock in 2003.